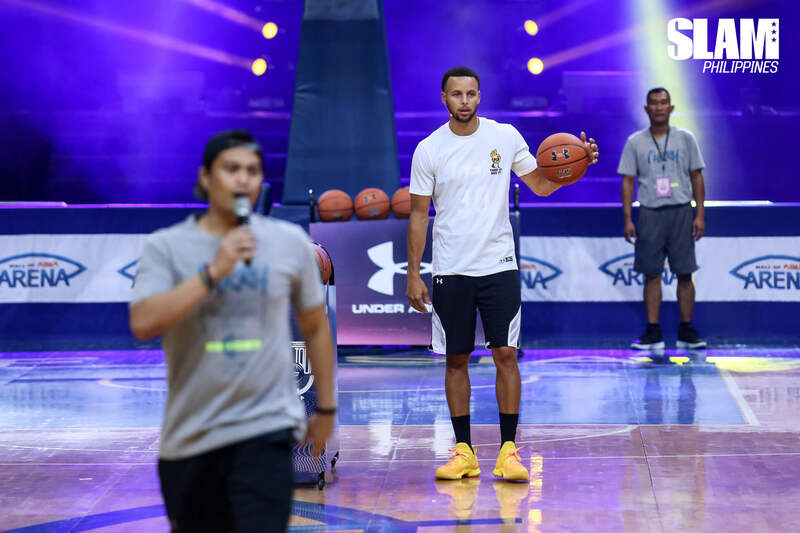 The last time Steph Curry was here, he was fresh off a championship and ready to celebrate with his Filipino fans. Curry is back in town for the SC Asia Tour 2018. Known for his limitless range and ankle-breaking handles, Curry became the face of Under Armour along with his meteoric rise to the NBA’s elite. Now in his second visit to the country, he was ready to celebrate once again after winning back-to-back NBA titles. The show kicked off with the UA 3×3 championships. The women’s finals was between Singapore and hometown heroes Philippines, while the men’s division had Thailand and Singapore in the titular fight. The young Filipinas went out with their guns blazing in the first match. They torched the Singaporeans from the get-go to win the women’s title. The men’s finals between Singapore and Thailand started close. The youngsters traded buckets early in the game. The Singaporeans suddenly caught fire in the middle of the game and never looked back. They were crowned as champions in the men’s division. It was after the 3×3 games when the main star of the show made his entrance. With game highlights and an energetic dance as his introduction, Stephen Curry appeared on stage to the fans’ delight. He was greeted with loud cheers and ‘Curry’ chants from the crowd. In the interview, Curry was adamant about what the Warriors want to achieve in the upcoming season: a three-peat. While he acknowledged that the competition became tougher in the West, he said that it won’t matter which team will they face as long as they will remain the last team standing. The show went on with a skills challenge. Select players from the 3×3 championships as well as PBA players Poy Erram, Troy Rosario, Mark Barroca and Peter June Simon participated in the event. Simon emerged victorious after three rounds of head-to-head matchups. He ended up facing Curry himself on the one-on-one skills event. The PBA Veteran outdueled the NBA MVP. Simon nailed the go-ahead three-pointer to edge out Curry in their match-up. The OG Curry also joined the festivities later in the show. Dell Curry teamed up with his son in two-ball shootout. Steph made up for his loss to Simon by putting on a show with his dad. The Currys defeated Willie Miller and his son, who edged out several other duos in the preliminary round. Other notable players who joined the event were Marc Pingris, Harvey Carey, Stanley Pringle and Janine Pontejos. Curry was here to promote the latest sneakers in his signature line, the Curry 5. Under Armour created an eye-catching yellow and orange colorway specifically for the Asia tour. The Asia-exclusive kicks definitely stole the show. It looked like a sleek weapon when Curry used it on court but also worked as a nice lifestyle option for a sneaker. Most of the players and hosts rocked the bright-colored pairs throughout the event. SPLASH ? . @stephencurry30 sat down with the SLAM Fam for a quick chat. Stay tuned for the full vid. Stay tuned to our pages for the SLAM PH Exclusive with Steph Curry. Check out photos of his visit to Titan BGC.